Richard is a proud member, past President, Examiner and member of the Board of Directors of IDTA. He has lectured at the London and Southport conferences, and in many IDTA Areas. Richard enjoys judging the superb Area and National Medallist events, and teaches all grades of dancer, be it professional or amateur. Having run a dance school for over 46 years, Richard strongly identifies with the needs of members. He enthusiastically endeavours to dedicate his time and energy - alongside his passion for innovation and development - into continuing to keep our association as the leader of the dance world. Lynda first entered a dance school at the age of ten and attended various classes in ballroom and theatre subjects; eight years later she took her first IDTA Associate examination. In 1991 she became an Examiner in the Ballroom Branch, giving her the opportunity to travel around the UK and overseas. She first lectured at Congress in 1996 and has since lectured at many Area meetings. Throughout these engagements she has enjoyed meeting other dance teachers who are also working to promote dance to the general public. She has also enjoyed working, as co-author with Lyndon Wainwright, on various commercial projects including the most successful Let's Dance published by Harper Collins in 2005. Lynda's own book Let's Rock 'n' Roll was first published in 2006; this technique is used for professional examinations. Further technical publications for IDTA have since followed, including Street Dance Guide, IDTA’s first syllabus and printed publication. She bought her dance school in 1987 and ran a very successful and busy medallist school in Essex, for more than 26 years, teaching children from the age of three through to adults of all ages and abilities. Still backed by a brilliant team of assistants, she always gets great satisfaction from teaching anyone to dance. Lynda, currently serving as a member of both the Freestyle Faculty and the Latin Faculty, enjoys the work that involves a strong commitment to the Association and its members. The opportunity to develop this involvement further came in 2005 when she was first elected to the Board of Directors. Jo started dancing age 4, showing great aptitude for dance and progressing successfully through all her grades. During this period she also competed in high level competitions, achieving the status of British Ballet Champion in 1976. Jo went on to perform professionally in both theatre and television. Starting her own very successful dance school 32 years ago, she decided that her ultimate goal was to become an IDTA examiner and adjudicator. After professional coaching she was successful in becoming a Fellow in all 4 Theatre Genres and Freestyle, adding Street, Cheer, Dance exercise and Gymnastic Diplomas to her portfolio as well. In 2002 Jo became an IDTA examiner, a role she has cherished for the last 15 years. She now examines at professional level and has had the opportunity to promote IDTA within the UK and also across the world. Over the last year she was honored to attend Australia, New Zealand and China promoting the IDTA. Having been educated and mentored by the best, she believes she has a broad understanding of how young professionals feel pushing themselves to succeed in our industry. The development of IDTA Ballroom and Theatre worldwide is now one of Jo's keen interests. Looking to the future and always listening to the members, she believes she has ideas, background and capability to provide security for the members professional and business careers in the years to come. Jo feels she is now in the position to dedicate herself to IDTA and its members worldwide. Ian commenced his career as a performer in Londons West End shows, Cats, Starlight Express, Joseph, Fame, The Royal Variety Show, and The Fleet’s In. He also appeared as dance captain in the Eclipse Cirque Musical, the National Tour of Peter Pan, and was the lead singer on the re-release of the Queen song, Who Wants To Live Forever with Brian May. IDTA trained from the outset by Phil Winston, Ian co-devised the Musical Theatre Syllabus realising its potential across the Ballroom, Freestyle, and Theatre disciplines. He is currently Chairman of the Theatrecraft Faculty, and is a member of the Quality Assurance Panel (QAP) for the Association. On gaining his qualification as a singing teacher he wrote the book Sing Sing Sing, and was the composer of the album The Good Singer, both of these tools supporting our syllabi. Ian is co-principal of The Dance School - Solihull, which is proud to have nurtured many Musical Theatre performers through the IDTA structure. His involvement as the announcer on the Ballroom and Street Dance DVDs, and as a judge for the All England Finals, British Championships, Street Dance Medalist, and the Theatre Awards has allowed him to work alongside many influential dance Professionals across all genres, and to witness the very best that our Association has to offer. 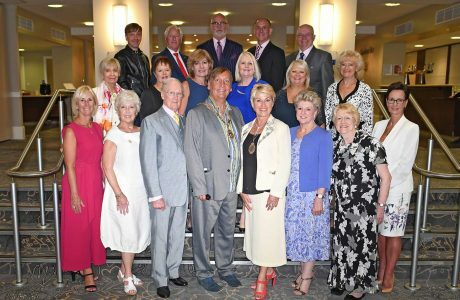 A member for over 20 years, an Examiner for 10 years, Ian believes that he can assist in moving the IDTA forward, upholding its reputation as the Heart of Dance Worldwide. Michael is a Fellow and Examiner of IDTA, and former Chairman of the North West Area Ballroom Committee. Having grown up in the business, Michael and his wife Marie had a successful amateur and professional competitive career, and are former finalists in the World and European Professional ten dance championships. When they retired from competing they opened their first dance studio and now run IDTA studios in three locations. Over the past 20 years IDTA members have supported him with advice and assistance, and as a Director he is able to return that support by working hard for members of the Association. Michael is a member of many IDTA committees including the Ballroom and Latin Faculties, the Finance & General Purposes Committee and London Meeting and Congress Arrangements Committee. With 30 years of service as an IDTA Examiner, Yvonne has a wide experience in Ballroom, Latin, Classical Sequence and Freestyle. Since the age of 17 she has taught social and medallist dancers to achieve their ambitions, and now coaches many professionals for their qualifications. With her in-depth knowledge and teaching techniques, she has pioneered to increase the IDTA’s visibility globally by successfully establishing links in other countries. A former Chairman of the Ballroom Faculty, and current Chairman of the Latin Faculty, Yvonne is a team player - contributing new ideas whilst always taking into consideration the needs of the IDTA members and the high standards of this Association. She contributes regularly to the Dance International Magazine with her Saunders Snippets feature. She feels strongly about developing wider communications within the IDTA, specifically the links between the Theatre and Ballroom branches. The growth, development and structure of the dance business has never been so important as at this time.